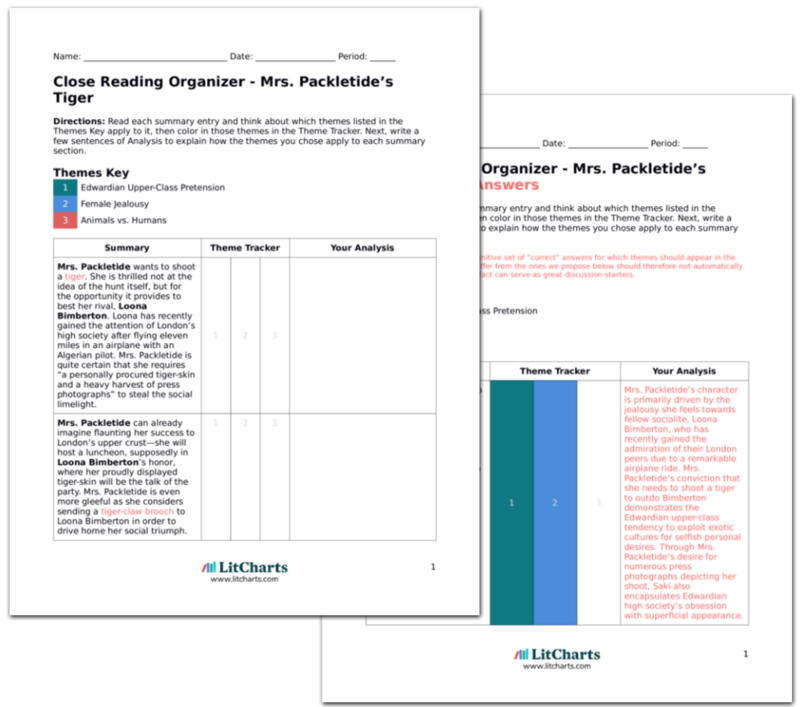 Instant downloads of all 946 LitChart PDFs (including Mrs. Packletide’s Tiger). 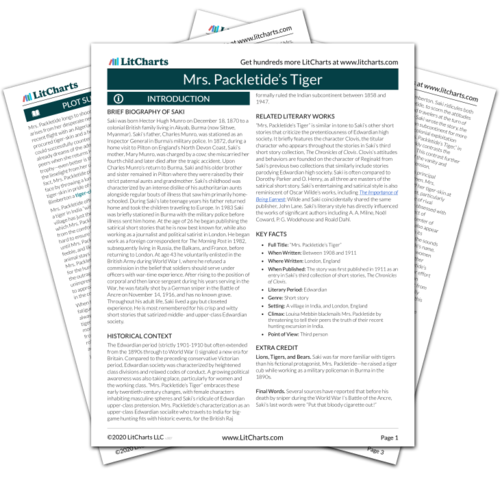 Welcome to the LitCharts study guide on Saki's Mrs. Packletide’s Tiger. Created by the original team behind SparkNotes, LitCharts are the world's best literature guides. A concise biography of Saki plus historical and literary context for Mrs. Packletide’s Tiger. A quick-reference summary: Mrs. Packletide’s Tiger on a single page. In-depth summary and analysis of every of Mrs. Packletide’s Tiger. Visual theme-tracking, too. Explanations, analysis, and visualizations of Mrs. Packletide’s Tiger's themes. Mrs. Packletide’s Tiger's important quotes, sortable by theme, character, or . Description, analysis, and timelines for Mrs. Packletide’s Tiger's characters. Explanations of Mrs. Packletide’s Tiger's symbols, and tracking of where they appear. An interactive data visualization of Mrs. Packletide’s Tiger's plot and themes. Saki was born Hector Hugh Munro on December 18, 1870 to a colonial British family living in Akyab, Burma (now Sittwe, Myanmar). Saki’s father, Charles Munro, was stationed as an Inspector General in Burma’s military police. In 1872, during a home visit to Pilton on England’s North Devon Coast, Saki’s mother, Mary Munro, was charged by a cow; she miscarried her fourth child and later died after the tragic accident. Upon Charles Munro’s return to Burma, Saki and his older brother and sister remained in Pilton where they were raised by their strict paternal aunts and grandmother. Saki’s childhood was characterized by an intense dislike of his authoritarian aunts alongside regular bouts of illness that saw him primarily home-schooled. During Saki’s late teenage years his father returned home and took the children traveling to Europe. In 1983 Saki was briefly stationed in Burma with the military police before illness sent him home. At the age of 26 he began publishing the satirical short stories that he is now best known for, while also working as a journalist and political satirist in London. He began work as a foreign correspondent for The Morning Post in 1982, subsequently living in Russia, the Balkans, and France, before returning to London. At age 43 he voluntarily enlisted in the British Army during World War I, where he refused a commission in the belief that soldiers should serve under officers with war-time experience. After rising to the position of corporal and then lance sergeant during his years serving in the War, he was fatally shot by a German sniper in the Battle of Ancre on November 14, 1916, and has no known grave. Throughout his adult life, Saki lived a gay but closeted experience. He is most remembered for his crisp and witty short stories that satirized middle- and upper-class Edwardian society. 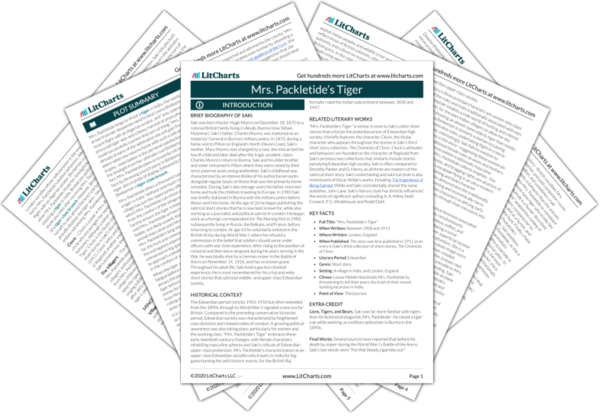 Get the entire Mrs. Packletide’s Tiger LitChart as a printable PDF. The Edwardian period (strictly 1901-1910 but often extended from the 1890s through to World War I) signaled a new era for Britain. Compared to the preceding conservative Victorian period, Edwardian society was characterized by heightened class divisions and relaxed codes of conduct. A growing political awareness was also taking place, particularly for women and the working class. “Mrs. Packletide’s Tiger” embraces these early twentieth-century changes, with female characters inhabiting masculine spheres and Saki’s ridicule of Edwardian upper-class pretension. Mrs. Packletide’s characterization as an upper-class Edwardian socialite who travels to India for big-game hunting fits with historic events, for the British Raj formally ruled the Indian subcontinent between 1858 and 1947. “Mrs. Packletide’s Tiger” is similar in tone to Saki’s other short stories that criticize the pretentiousness of Edwardian high society. It briefly features the character Clovis, the titular character who appears throughout the stories in Saki’s third short story collection, The Chronicles of Clovis. Clovis’s attitudes and behaviors are founded on the character of Reginald from Saki’s previous two collections that similarly include stories parodying Edwardian high society. Saki is often compared to Dorothy Parker and O. Henry, as all three are masters of the satirical short story. Saki’s entertaining and satirical style is also reminiscent of Oscar Wilde’s works, including The Importance of Being Earnest; Wilde and Saki coincidentally shared the same publisher, John Lane. Saki’s literary style has directly influenced the works of significant authors including A. A. Milne, Noël Coward, P. G. Wodehouse and Roald Dahl. When Published: The story was first published in 1911 as an entry in Saki’s third collection of short stories, The Chronicles of Clovis. Climax: Louisa Mebbin blackmails Mrs. Packletide by threatening to tell their peers the truth of their recent hunting excursion in India. Lions, Tigers, and Bears. Saki was far more familiar with tigers than his fictional protagonist, Mrs. Packletide—he raised a tiger cub while working as a military policeman in Burma in the 1890s. Archibald, Georgie. "Mrs. Packletide’s Tiger." LitCharts. LitCharts LLC, 20 Nov 2018. Web. 11 Dec 2018. Archibald, Georgie. "Mrs. Packletide’s Tiger." LitCharts LLC, November 20, 2018. Retrieved December 11, 2018. https://www.litcharts.com/lit/mrs-packletide-s-tiger.